The Center on Rural Innovation along-side Rural Innovation Strategies, Inc. announced communities selected to participate in the Rural Innovation Initiative. Go Forward Pine Bluff was among nine communities who were selected. This program will support the Pine Bluff community by working to create digital economy jobs with an innovation hub strategy. An agreement between RISI and the U.S. Economic Development Administration made this program possible. Matt Dunne, CORI Founder and Executive Director of RISI says, “These nine communities represent the best of what America has to offer; strong visions for the future, solid infrastructure, excellent quality of life, and the talented workforce needed to engage at a high-level in digital economy.” More than 130 communities from 40 states applied for the program, but nine, including Pine Bluff, stood out. Participants will receive a range of support. 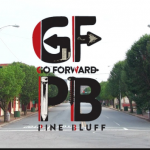 Go Forward Pine Bluff will have access to significant technical assistance to refine their economic development strategy, help identify partnerships, leverage existing resources, and be able to raise up to $50,000 in operating funding. Go Forward Pine Bluff was selected based on available area real estate, partnership with a selective four-year endowed residential college or university, and by being a non-profit organization.